We are visiting a good friend Kent MacDonald on Prince Edward Island presently. Atlantic Canada is such a real place. People have been living authentically here for years, as the economy requires that of them. It is a place that still lives within its resource based and agrarian roots, and the people still live within real communities where neighbours really know each other and people identify with their towns. In these places you either “live here” or you are “from away”. We arrived in a tired state having taken an overnight flight that was late, so we missed our connection and were re-routed and ended up arriving about 6 hours late. 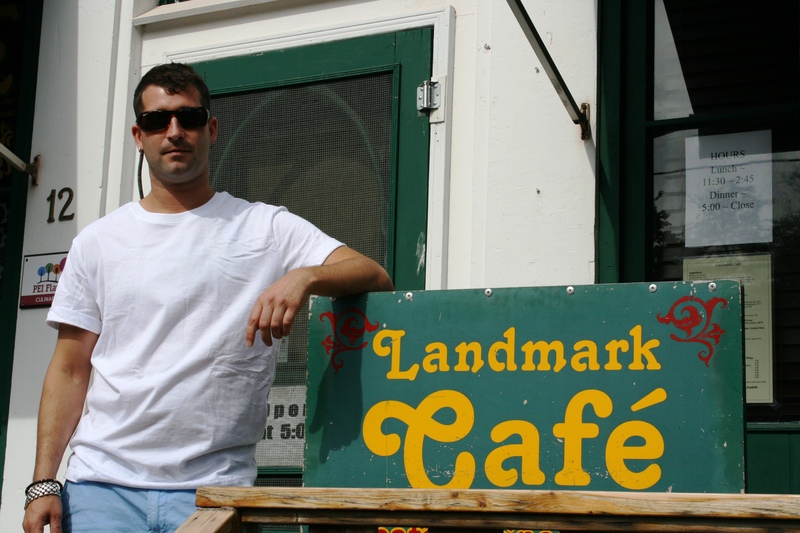 We headed out for dinner at the Landmark Café, a local institution run by friends of our host. The food is always wonderful at the Landmark, but I think more notable is the warmth of the service as it is offered by members of the family. Our waiter was Olivier “Ollie” Sauvé and his father Eugene is the chef. The Landmark is actually a total family operation as Ollie’s sister Rachel is also a part of the amazing service. Ollie served us with expertise combined with both warmth and humour. We took his advice on choices, we joked and really just got to know him. What we found was the artist behind the waiter. 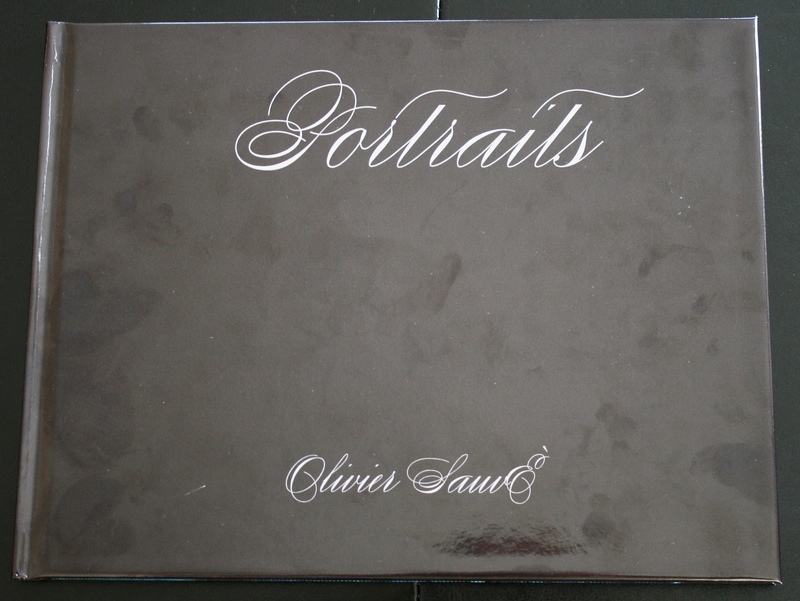 Ollie has created a book of his work as a portrait photographer. Victoria-by-the-Sea is a community that thrives in tourist season, but then goes dormant for the winter. In those winter months Ollie likes to travel to other continents. He takes his camera and has a gift in capturing the human soul in a photograph. He picks unique faces out of a crowd and then has a knack for getting people to just be themselves in front of his camera. His book is remarkable … one of those pieces of work that you can pick up again and again and again to gain the benefit of its artistic value (some might say spiritual force). So Ollie inspired me with his work. But he also got me thinking about something else. That is, how many people walk into the Landmark Café and see Ollie the waiter without thinking what is behind that cover? How many of those people get to know Ollie the artist? That train of thought continued for me to say how many times do I see someone only as how they originally present to me? A waiter, a doctor, an accountant, a driver, a stranger, a dissenter. Do I put a cover on people and then I assume I know what the book is about? Such that I miss the real story? Do I fail to see the artist, the healer, the teacher, the humanitarian, the builder, the giver, the volunteer, the listener? Am I often too myopically focused on what I need to accomplish that I see only the cover … only that label that tells me how that person can help me accomplish this tactical task? Do I take the time often enough to learn about the book … the depth of the story that hides behind how that person first appears to me? Do I begin to understand what really makes that person tick … what their passions are and what brings them joy? Do I miss the true gift in them that each of us truly has by only looking at what I need from them now? Then I find a thought that causes me some discomfort, maybe even fear. How many truly amazing people have I met only superficially where I never got to know how truly gifted they are. It actually caused me to feel a sense of loss. I used the phrase last week that the greatest role of a leader is to hold a space in which others can be great. It occurs to me that I can’t do that if I don’t open the cover and read the book. Do I spend enough time with those I work with to truly understand their story? When I do know their story, do I then look to find opportunities for them to use their gifts to shine? Artist, healer, teacher, humanitarian, builder, giver, volunteer, listener Or do I close the book and revert to what the cover says when I think of their role? Waiter, doctor, accountant, engineer, salesperson, nurse. So two big thank you’s to Olivier Sauvé. One for sharing his beautiful art with us (we bought the book!) and the second for inspiring me to focus on the book behind the cover! Ahh Ian, I am very moved by this post because, I too, value the gifts of people and how they can contribute them in their communities, teams, families, etc. What a beautiful way to illustrate this concept. I love Atlantic Canada – have an awesome time there! Thanks Diana. Atlantic Canada is the perfect place to discover these simple truths. People really are just who they are! The authentic living in that area seems much like that on the pacific side as well, the Alaskan pan handle. I had a trip there a few years ago and it was as if time stood still. The people were so genuine and had so much to impart. I love your analogy of the book and the cover. I feel that I do it too often, judge people by the cover, and really should read the whole book more often. Interesting thoughts Elizabeth. Do you think that we judge the book based on the cover or merely its utility to us? Now that got me thinking. Probably, me being me, its utility to us. However, it helps if the cover attracts me in the first place (by a smile or gesture etc). I suppose I see a bar-tender as someone who serves me a drink. But when I actually stop and talk to him / her there is a story there, a person. Do you find it interesting that one tends to do that ie: stop and talk more in-depth with people, when on holidays (vacation). Why don’t we do that all the time? Aren’t we always worried about “getting stuff done” and therefore think that looking behind the cover may take too much time? Love it! Thanks for the thought! It looked like a good post this morning, but I didn’t get a chance to read it. Sounds like you’re in PEI, I hope it goes well and you have an enjoyable time. Try to visit some local restaurants while you’re there. The topic a “book and its cover” is a great topic and covered by lots of people. I think sometimes we do pre-judge, assuming based on the title that’s the subject you’re dealing with. Great post Ian! How many times do I do that exact thing i did above in my encounters with people? I “skim” them , assuming based on their appearance, profession, their stuff, … I actually understand them or even can presume to know them. Great reminder of the incredible stories, experiences, wisdom and potential that’s held with in each of us. And what great reminder of the richness and joy we discover when we explore those depths with the humans we have the privalage of interacting with daily. You always make my day with your comments! What if each of us made a pact with ourselves to stop and look past first impressions with one person a day. What would happen to our world then? Thank you for the comment. You have every right to be proud of Olivier and what he brings to the world.